what a great idea for the theme---wonderful picture! I do miss the kids having the old-fashioned lunchboxes though!! Love your photo. And its so true. My granddaughter, who is in the 2nd grade, has a lunchbox that looks just like a purse. She also has a 2nd one similar to some of the ones in your photo. I have a collection of vintage metal lunchboxs with HollyHobby picture scenes on them ( one for each season). I guess none of today's kids would even consider actually using one of them. Fabulous capture of organization at school! Since I have 2 (grown) sons, our vintage lunch boxes are HE -MAN (Masters of the Universe) and GI JOE...much more fun than today's "lunch boxes" even if they did not keep things cold! 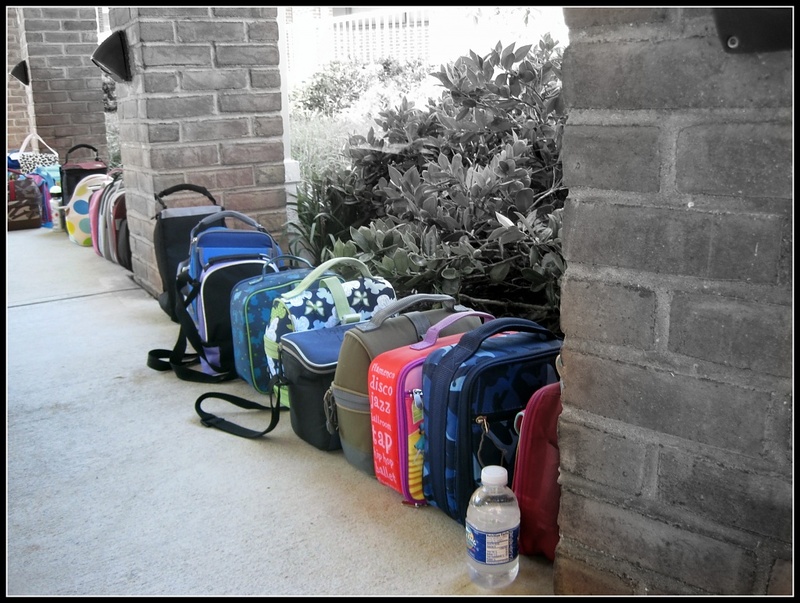 Love the photo of "todays" lunch boxes! It reminds me of my Fat Albert lunch box. Oh ya, Allison ~ I love how you left the lunch boxes in color and black and white with every thing else. Awesome. Really like this shot. But, at first I thought they were suitcases:) Really, lunch boxes? Do the kids have to take lunch to school from home? Here in Finland school provides the lunch (warm food, salad, bread, milk, dessert which can be fruits or something). And it's free. But those lunch boxes are very pretty. And I like the selective coloring. Goodness.... those bags are huge! They're like suitcases! A plastic box in my schoolbag, or a metal tin .... and it stayed there getting warmer and warmer through the day! And if you forgot to bring home your box then it was indeed a paper bag with very, very flat sandwiches by lunchtime! cool! i love how these luggages all lined up. Nice shot! Much more safe minded now days to keep things at their proper temperature. but about 20% choose to bring their lunch from home. I'm guessing for some it's a financial decision. I still use one of the metal ones! My kids got it for me a couple years ago; it's Peanuts. Yes, lunches have changed as well. Great idea for a picture! Lunch boxes sure have changed! Those metal ones could leave a knot on your head if someone 'bumped' you with it! Clever shot for the theme, too! nice shot, allison. i don't care much for lunchboxes with movies stars in them, but i do like the safety features. this is great for the theme. Allison, thanks for the explanation. I guess I'd choose the lunch box too. Nothing better than home made food. Great idea for a picture! It's gotta be fun for the kids to choose their own lunch-boxes before school starts for the year. Love the selective color - nice shot! Keeps things safe and organized. what a great shot-love the variety of shapes and colors------fun! Great shot. It tells the story perfect.